With a diameter of a centimetre and a couple of competing core options to select, this 10mm 6×36 stainless steel wire rope has a variety of lifting tasks wrapped up. It is a worthy choice amongst our stainless steel rope range, delivering durability and strength. The obvious distinction between the independent wire core and the fibre core iteration of this 10mm stainless steel rope is that of load capacity. The former has a 5,697kg WLL, while the latter offers a lower 5,281kg maximum. On the plus side, the fibre example is lighter and a little more flexible, while also being just as capable of resisting corrosion as all of its stainless steel stable mates. So for maritime use, as well as a selection of outdoor lifting and construction purposes, either core will come up trumps. Our wire rope range is extensive, factoring in crane rope, non-rotating rope, plastic coated rope and lots more options besides. Should you be looking to create a wire rope assembly, our team can also rise to the challenge, using whatever fittings are most appropriate. Be sure to take the benefits and limitations of each material into account when choosing. The resilience of stainless steel may not be relevant in some cases, while in others it might be essential. The fastest way to get a quote for wire rope is to call 01384 78004 and let our team help you out. Our rapid response form is also available for customers who prefer communicating via email. 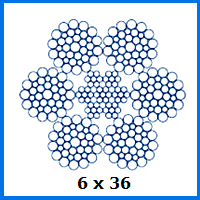 10mm 6x36 Stainless Steel Wire Rope Overall rating: 5 out of 5 based on 6 reviews.